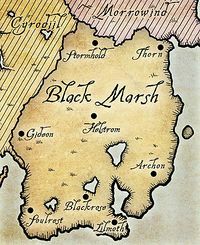 Onkobra River is a fast-moving stream that runs into the dark center of Black Marsh from various points in the province. One of the river estuaries of the Onkobra runs around the city of Gideon, along a muddy and dysfunctional road. This estuary is found near the Topal Bay. There is another portion of the Onkobra in the region of Shadowfen, south of the port-town of Alten Corimont. 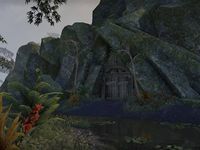 The Dark Elves had established a Kwama Mine called the Onkobra Kwama Mine, but when Argonian slaves were able to overwhelm their slavers, they took over the Kwama Mines in Black Marsh, including the Onkobra Mine. This, however, did not end successfully. All the while, armillary spheres showcasing the Aurbis etched in Onkobra Kwama Eggs were in circulation in 2E 582. This page was last modified on 15 November 2018, at 20:42.